Here’s something we could all do with – a little hormone loving. Our hormones are responsible for all body functions so it only makes sense to give them a little TLC every now and again. But before we dive in there – I have to touch on my big fat crazy viral-ness of a day yesterday. You may or may not have seen my blog post that went completely viral when I asked the question; is Angelina Jolie’s very public mastectomy prevention? If you haven’t seen it – I encourage you to take a read of it and it’s seventy eleven comments here. I talked about how lifestyle, diet, environment, thoughts, mindset, attitude etc, may influence how our genes work and how I struggle with the idea of removing breasts in attempt to prevent cancer for those who carry the gene, without further thought into any other factors. So for somebody with the breast cancer gene, whilst breast cancer acts differently in the body to others (it’s typically very aggressive) I encourage people to come back to such factors that support wellness. I stand by the points I made yesterday and I will continue to stay true to my mission – to help open people’s minds, explore new opportunities with regard to health and fertility and educate to enable everybody to make informed decisions with regard to health. I sure got criticised, challenged and the trolls came out to play big time. But you know what – if I’m not challenging people, then I’m not being authentic and then, I’m not doing justice to myself and my crusade. What’s more, if I’m not leading people to think outside of the circle, I’m not doing what I have stated I’m here to do. I am here to make a difference and speak from my heart and I make no apology for that. You know, nobody has actually straight up asked me what my opinion is with the Angelina Jolie mastectomy situation. This quote on my FB page summed it up so nicely for me – I thought I’d simply share it. That’s it for me. For Angelina, if she believes that it was 100% the right decision – who am I to argue? She did what she felt was right. What else is damn straight right is this chia seed pudding! I encourage you to eat this warm and do your digestive system a big favour – it loves warm food especially this time of year so grab yourself 2 minutes and whip this baby up! 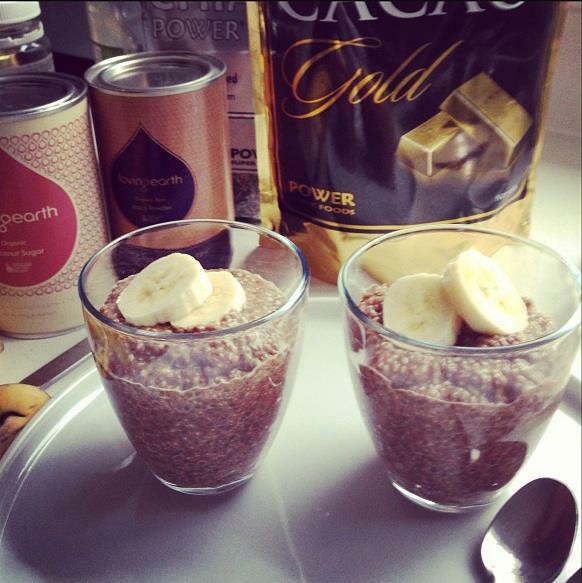 Combine the chia seeds with water, cacao, sweetener, maca and mesquite and mix well. Allow the chia seeds to swell – I suggest putting a lid on the mixture as it does so to keep it warm. This only takes 2-5 minutes depending. Place banana on top. You can either choose to top with almond milk or warm almond milk and substitute for warm water in the previous step. *maca is an adaptogen which helps your body cope better with stress and in turn helps to influences your hormones. It is particularly useful in the later stages of the menstrual cycle when PMS creeps in. I say add it to your food and drinks in the lead up to your period. I look forward to more wonderful blog posts from you and wish you all the best success. Continue with your message of wellness, you do not, unlike other proponents, encourage massively invasive preemptive medical procedures , based on probabilities and percentages of risks. Basically because you understand that a high percentage compared to the general population will also be comparing one to a pretty unhealthy ratio of people as a general population to start (in the west). There is no shame in what you have suggested. And those with traumatic life events will always be triggered by certain subjects of relevance to their trauma. The truth is you don’t own that. You own your truth and you practice what you preach. I’m not sure anyone can ask more of you. Comments on your last post were really interesting. I read your blog because it’s not always easy to find information on ‘non traditional’ ways of doing things, especially when you step outside the capital cities. You put the information out there and then I can decide what to do with it and I thank you for giving me that opportunity. Thanks for being authentic amidst the swell of opinions. Your voice is needed and I am so happy you are on your crusade.